In this article, the Harmonized System codes (Harmonized Tariff System- HTS) for Edible Vegetables are mentioned which help you in exporting and importing of Edible Vegetables. These codes help exporters and importer all over world to know product classification code named differently in each country like Schedule B, ITC, HS, HTS, Tariff Code etc. For example if you need to export or import Edible Vegetables from/to any country, the customs department and other government and non government agencies of respective country identify your product on the basis of harmonized system code. If you are importing or exporting Edible Vegetables, the 6 digit harmonized system code mentioned in this article is accepted all over world. In other words, the export and import of Edible Vegetables are categorized productwise under the information mentioned here. These harmonized system codes (HS codes) have been displayed in this web blog in a systematic order to make you understand and identify easily. I hope, the information in this article helps you for smooth import or export of Edible Vegetables. Click here Learn International trade online free. In this post, I have mentioned HS codes which help exporters and importers of Edible Vegetables. These HS codes helps exporters and importers of Edible Vegetables to identify their product to use in customs department and other government and non government agencies to import or export of Edible Vegetables. I hope the information in this post supports exporters and importers of Edible Vegetables. The buyers of Edible Vegetables and sellers of Edible Vegetables in import export trade may use the HS codes mentioned in this post. The suppliers of Edible Vegetables and buyers of Edible Vegetables in international trade may please be noted, an addition of two or four digits might be added to these HS codes by government of respective country. So the exporters or importers of Edible Vegetables may follow such addition if any after verifying with rules and regulations of respective country. 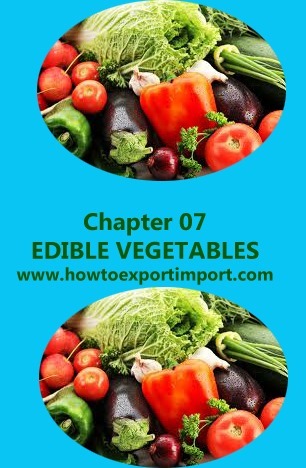 I will be writing about how to export Edible Vegetables and how to import Edible Vegetables shortly. The buyers of Edible Vegetables and sellers of Edible Vegetables in export import trade may also be noted, the classification of products is named differently in each country by adding two or four digits along with HS codes. For examples, in US (United States), the classification is called ‘Schedule B’ where as in India ‘ITC number (Indian Tariff Code number). 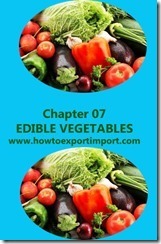 Hope this article helps importers of Edible Vegetables and exporters of Edible Vegetables. Comment below your thoughts.